I have personally talked with a customer that did a few simple modifications to this design, and has built a small 300 hp motor which is no bigger than a mans hat. He said his engine can fit into the palm of his hand and can produce about 300 hp x 2,000 rpm's. As I was talking with him I could hear the fear in his voice, He basically told me he did not know what to do with it? He was an older gentleman and was scared that someone was going to come and take his motor or hurt him or his family! That was many years ago, and at that time I did not really care that much about the Tesla Turbine technology because I was doing my own research on the Fuelless Engine motor. So I let the guy go ( that is something I regret to this day ) and did not save his name or number. No doubt it would have saved me a few hours of research time! From what the man told me, it is very simple to modify and is simple in design! Today other Tesla Turbine researchers are only getting about 40% to 50% efficiency. So if what this guy said is true, he has gone well over the 100% efficiency mark, and into the realm of free energy! I have also talked to another researcher on the phone about 7 years ago and he said his Tesla Turbine is running at about 96% efficiency! 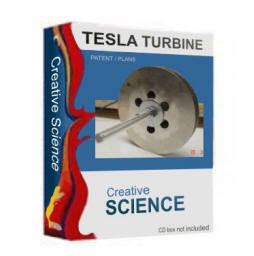 We have built, designed and tested a more simple version of Nikola Tesla's turbine motor but have not yet had the time to write step by step plans for it. So all we can offer you at this time is The Tesla Turbine US Patent. It is simple in design and can be easy to construct from the US Patent itself. We are also including 2 color photo's of 2 different size Tesla Turbine motor's made by 2 of our customers constructed in a machine shop. But you do not need a machine shop to build one of these motors. All you need is a small drill press and a drill press circle cutter, that you can buy from Sears for only $20. Other tools you will need for the job is simple common garage tools. The Tesla Turbine also makes a great steam engine motor to run a, AC or DC generator. You can also convert a pressure cooker into a steam broiler to produce steam to run your Tesla Turbine. There are a few companies on the internet that can build these for you as well. Learn how to build powerful high voltage capacitors right in your own home or garage. Great for many free energy experiments as well as anti-gravity lifters. We have used these plans to build a large 5000 Volt AC capacitor to help run our free energy Fuelless Engine. Learn how the thickness of the die electric material determines the high voltage rating of the capacitor. These plans are packed with more information than youll use in a life time! A must for high voltage experimenters, includes many different designs and safety info. Great for making your own high power permanent magnets etc... These capacitors are a must for many free energy devices. Windmills For The 21st Century! working windmill and low rpm windmill generator. discovery, you can then easily scale it up to reach much higher voltage and amperage levels! It is very possible to make a windmill so powerful you can run your entire home. With the old windmill designs this was impossible! Use your new windmill to charge a 12 volt dc deep cycle marine battery, you can buy these batteries anywhere. You will then need to buy or build a 2,000 to 5,000 watt inverter, we sell the plans for this. Inverters are sold on the internet from solar panel companies or RV supply stores in your area, I am also seeing smaller ones being sold at local automotive stores as well as K-mart and Walmart Stores. The inverter can then be connected to any 12V DC battery. The 12 volts is then stepped up to 115V DC and then converts the DC to 115V AC x 60 Hz. Some inverters output pure sine wave current. The same electrical wave that comes to your home from the electric company. These type of inverters cost a little more, but are well worth it in the long run. Most cheaper inverters output the modified sine wave and can run just about anything in your home including lights, TV sets, computers, DVD players, VCR's, refrigerators, sump pumps etc. 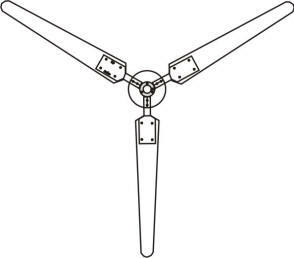 This is NEW WINDMILL GENERATOR TECHNOLOGY not seen anywhere else before! David Waggoner has kept this new technology under lock and key for over a year now because of Copyright and Patent Pending reasons. But now his new discovery is open to the world! The Generator is also great to use with existing windmills as well as our Fuelless Engine and our Gravity motor. Our SP500 AC or DC low rpm generator is even better than the generator in these plans and is a great addition and upgrade. See our SP500 Generator plans. Did you know that you can even build a Windmill from old automotive junk yard parts? Just think, you will never have to worry about your lights going out during a storm, and you can even store the extra energy to use later and lower your electric bills! Better yet buy our Fuelless Engine plans to run our New Low rpm SP500 Generator. Our generator can be made to run at 14 volts, 120 volts or 220 volts AC or DC. You can run your entire home with these easy to build devices. Please add $14.95 for shipping US or Canada - or $14.95 shipping outside the USA.